Sometimes we feel like we need to change hairstyle when we feel like we need a change in our lives and we result in using scissors in our hair that we then regret. So, in this video, we show you how you can achieve beautiful hairstyles without having to use any scissors on your hair and you can also test with these hairstyles whether a new hairstyle will suit your face. - We show you how to create a short bob hairstyle without having to cut your hair, the only thing you'll need is a long ribbon in order to tie them at the back and then create a cute bow on top. - We also show you how to put your hair up in a super cute ponytail without even having a hair tie. You simply twist them at the back, place them through on side-part of your hair and the repeat the same thing on the opposite side. Watch our video tutorial for the full demonstration. - Sometimes putting our hair up in a high ponytail can make it a struggle because most of the time, the ponytail gets lose after an hour or two. 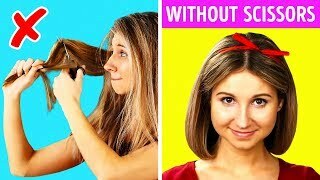 So, in this video, we show you how you can connect two hair ties with some bobby pins in order to keep your ponytail high-up and prevent it from getting loose. In addition, you can use a hair strand in order to hide the hair tie and make it look more fabulous. - If you would like to test whether you can rock bangs without having to cut your hair. We show you how you can use hair extensions and how to wear them in order to make it appear that you've just cut your hair, and we show you how to hide them using a headband. For those brides to be, who are looking for inspiration on how to make their hair on their wedding day, we show you some brilliant bridal hairstyles that are very romantic and super easy to re-create in order to give you inspiration for your wedding day. The best part is yet to come. Because they are so easy to re-create you can practice them on your own hair first in order to see what suits you best. Watch our whole video to see all of our scissorless hair hacks that you'll definitely want to try. Not only on special occasions but also if you are looking for ideas for your school hairstyles or at work every day. Stay tuned until the end of the video to see some hair fails that will make you chuckle.